Published in Rafu Shimpo, July 8, 1970, Japanese section. 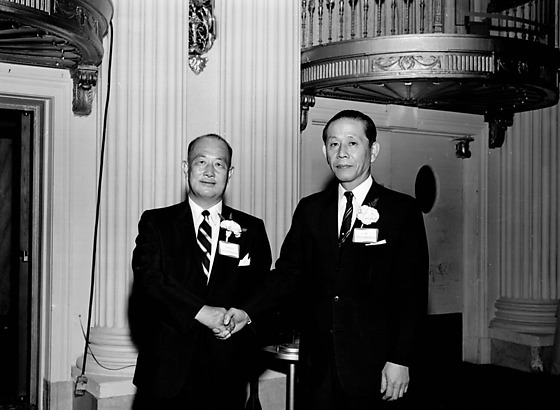 Mitsubishi Trading Company, or Mitsubishi Shoji, held a party to introduce new manager Eichi Tamai and bid farewell to vice president and Los Angeles manager Goro Chikaishi at Biltmore Hotel in Los Angeles, California, July 7, 1970. 1P and 2N: Three Japanese men in suits with name tags and two women standing in a row. Chikaishi and wife stand at left, Tamai and wife stand in center, unknown smiling man at far right. 3N: Two men wearing carnation boutonnieres shaking hands. Goro Chikaishi, left, and Eichi Tamai, right. Written on original envelope: Mitsubishi Shoji -- Changing of Manager at Biltmore Hotel.